Empowerment training is about showing our dogs that the environment is something they can affect and control. Most training is about instilling control onto our dogs instead of showing them how to have self-control and understanding. 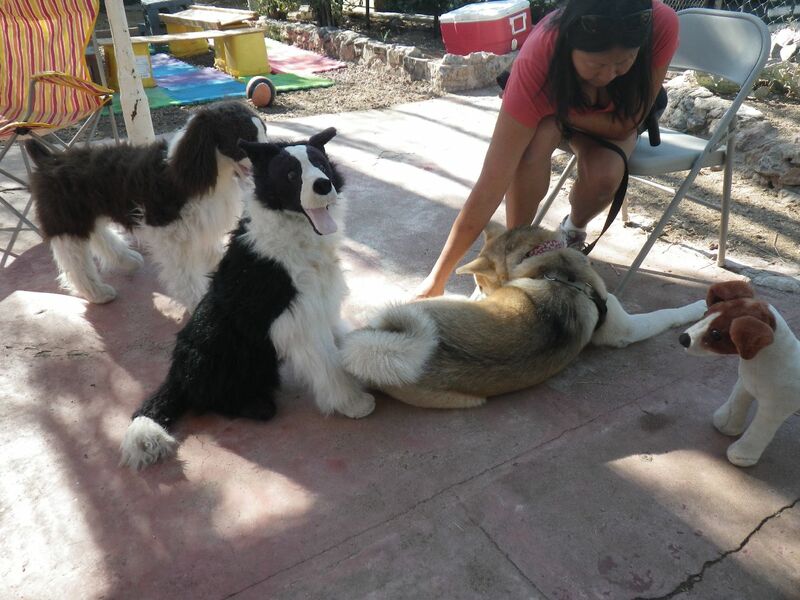 This program is designed to help shy, fearful, anxious, reactive and aggressive dogs. Like any other training, first we will ensure that your dog's basic needs are being met. Those needs are the physical ones of food, water, medical attention if necessary, exercise, play and mental challenge. Whether your dog is a senior, an adult or a puppy, this Empowerment is what socialization should have been and will reintroduce the dog to viewing all environments as pleasurable. Functional training takes us back to the roots of our association with canines and getting back to the basics of movement, body awareness, the flow that should be inherent in moving from space to space and when navigating obstacles, balance, coordination, flexibility and agility. Functional Agility helps provide your dog with the strength, stability, power, mobility, endurance and flexibility that s/he needs to thrive as s/he moves through life and sports. Using basic functional movement patterns like pushing, pulling, lunging, squatting, rotating, carrying and gait patterns, Functional Training utilizes exercises that improve movement proficiency, enhance performance and decrease injury. Stress is the body’s way of responding to any kind of demand or threat. When a dog feels threatened, his nervous system responds by releasing a flood of stress hormones which includes adrenaline and cortisol. These hormones rouse the body for emergency action. Stress happens every day for many reasons, including learning new things or practicing known behaviors to perfection. Without stress responses, your dog would probably not learn. But beyond the comfort zone, stress stops being helpful and can start causing major damage to your dog’s mind and body. Give your dog a vacation from stress and reduce the amount of stress hormones in your dog's body. For nearly 15,000 years dogs have lived with and served us as companions, hunters, shepherds and most recently detectives. Canine Detectives take advantage of the hundreds of millions of odor receptors they have in comparison to only a few million for humans. Over the last century, their incredible nose makes dogs sought after by nearly every segment of society. A biodetection dog is a dog trained to detect conditions and diseases in humans. For instance, dogs can be trained to identify the odor of cancer, or minute changes in body odor that reflect dangerous blood chemistry for people with diabetes, Parkinson's Disease, or seizure disorders. These alert dogs can warn their owners, support them during episodes, bring vital medical supplies, and even call for assistance. TUCSON October 25, 2018 -- Seize the Leash has been selected for the 2018 Tucson Award in the Dog Trainer category by the Tucson Award Program. Each year, the Tucson Award Program identifies companies that we believe have achieved exceptional marketing success in their local community and business category. These are local companies that enhance the positive image of small business through service to their customers and our community. These exceptional companies help make the Tucson area a great place to live, work and play. Various sources of information were gathered and analyzed to choose the winners in each category. The 2018 Tucson Award Program focuses on quality, not quantity. Winners are determined based on the information gathered both internally by the Tucson Award Program and data provided by third parties. The Tucson Award Program is an annual awards program honoring the achievements and accomplishments of local businesses throughout the Tucson area. Recognition is given to those companies that have shown the ability to use their best practices and implemented programs to generate competitive advantages and long-term value.